Palin knew there were ways to solve her money problems, and then some. Planning quickly got under way for a book….Two former Palin-campaign aides — Jason Recher and Doug McMarlin — were hired to plan a book tour with all the trappings of a national political campaign. 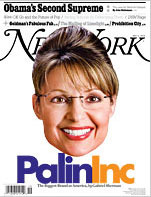 But there was a hitch: With Alaska’s strict ethics rules, Palin worried that her day job would get in the way. In March, she petitioned the Alaska attorney general’s office, which responded with a lengthy list of conditions. “There was no way she could go on a book tour while being governor” is how one member of her Alaska staff put it. On Friday morning, July 3, Palin called her cameraman to her house in Wasilla and asked him to be on hand to record a prepared speech. Around noon, in front of a throng of national reporters, she announced that she was stepping down as governor. To many, it seemed a mysterious move, defying the logic of a potential presidential candidate, and possibly reflecting some hidden scandal — but in fact the choice may have been as easy as balancing a checkbook.